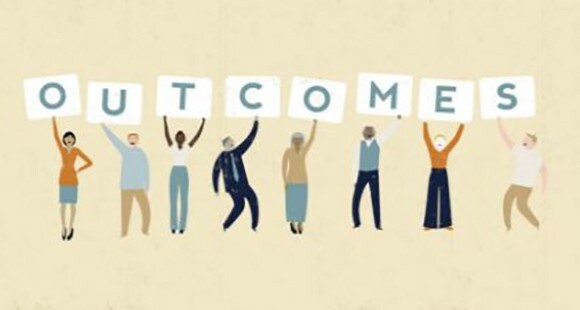 What does “managing to outcomes” mean and why are small and large organisations alike embarking on this journey, asks consulting director with Social Ventures Australia Simon Faivel. A few years ago, we were meeting with the CEO and a board member of an Australian Not for Profit organisation. We were sharing the results of their Social Return on Investment evaluation, which looked back at the prior three years of operations. The results showed that the program had not delivered the impact expected, and offered some surprising insights as to why that was the case. The CEO left the meeting clearly shocked and disappointed to discover that the areas of focus of the organisation were not necessarily the areas valued by their clients. This story is part of a broader trend in the social sector where we are seeing an increasing focus on measuring the things that matter most – the outcomes of investments and activities that create social change. But measuring is only one half of the story. Real change comes through building a culture in both service delivery organisations and funders that understands how to use this data to manage to outcomes. The term and practice of “managing to outcomes” was comprehensively described in Mario Morino’s monograph Leap of Reason: Managing to Outcomes in an Era of Scarcity. Morino, co-founder of Venture Philanthropy Partners, one of the oldest venture philanthropy funds in America, argues that both Not for Profit organisations and funders must focus on actively pursuing “meaningful, measurable good” for the clients and communities they serve. Of course, this is exactly what nearly every organisation would argue they are doing, but Morino believes that they are not always succeeding because their focus is misplaced. To find new ways of addressing challenging problems: by building knowledge about what works and why, Not for Profit organisations and funders will be able to develop stronger solutions for the problems they are working to address. Apply rigour within reason: overly rigorous assessments result in misallocation of resources. Open dialogues should exist between Not for Profit organisations and their funders to determine a suitable level of rigour – a level that matches the program’s strategic and evaluation objectives. To help organisations “make a leap” to managing to outcomes, Morino developed a framework. This framework brings together decades of practical experience from experts across private, government and Not for Profit sectors and is as relevant for small organisations through to large partnerships. 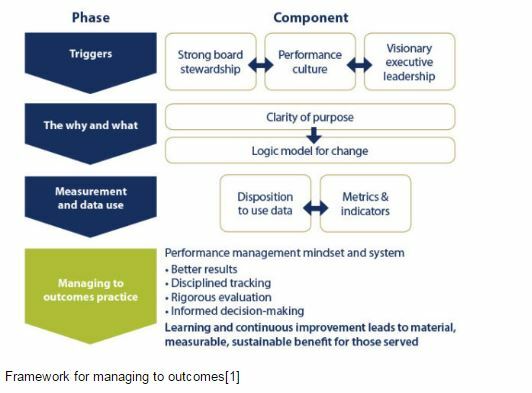 SVA Consulting has adapted and used this framework with great success with many of its clients to diagnose organisational readiness for managing to outcomes and to inform strategic planning. A strong and visionary leader is essential to herald change in mindset and behaviours required of most Not for Profit organisations or funders to transition to managing to outcomes. This kind of leader is not afraid to challenge a status quo and is willing to overhaul the old way of working. To complete the logic model, the outcomes for the intended beneficiaries through each of the program and/or service the organisation offers must be clearly articulated. SVA uses the “Golden Thread” methodology to identify and prioritise outcomes to develop compelling logic models. In order for organisations to manage to outcomes, they need to collect the right data and use it to make decisions. The next step in the process is to agree on how progress towards each outcome will be assessed. This process will identify a set of indicators that will provide data about progress. The selected indicators should have a clear linkage to the desired outcomes, be validated and practical. If the information collected does not help guide decision making or inform service delivery, the indicators may need to be reviewed. YMCA Victoria is successfully implementing this across a selection of its programs. It is also using technology for the collection and analysis of data. The right technology is not a panacea for managing to outcomes, but it will support better and more timely decision making based on evidence. For more information about how YMCA Victoria has done this, see Look before you leap into buying outcomes measurement software. About the author: Simon Faivel is a director in the consulting team. Faivel’s focus is on measurement and evaluation and he leads SVA’s work on Social Return on Investment (SROI). He is an accredited SROI trainer and practitioner. 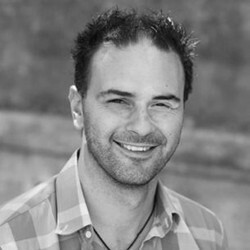 Faivel is also the chair of the Social Impact Measurement Network of Australia (SIMNA) Steering Committee, a board member of Social Value International (SVI) and is on the international SROI Network Methodology Sub-Committee. This article was first published in SVA Quarterly.